The very best traditional Greek spanakopita recipe! 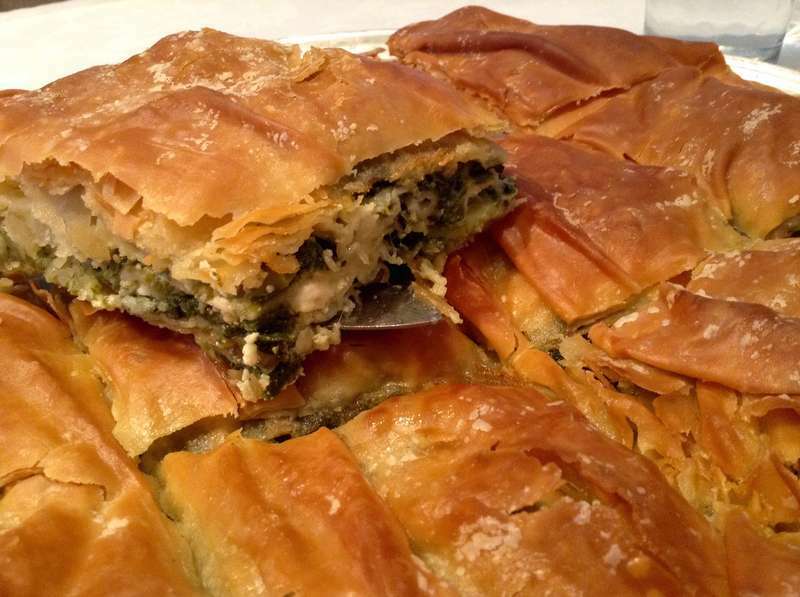 Spanakopita (Greek spinach pie) is one of the most popular Greek dishes, that is known and loved around the world. A very versatile and delicious Greek dish suitable for every time of the day, as a main dish, starter or mid-day snack! To prepare an authentic spanakopita recipe, feta cheese is crumbled and mixed with spinach into a herby spinach-feta mixture and then wrapped or layered in phyllo (filo) pastry, brushed with melted butter or olive oil and baked until golden and crispy perfection.. Simply delicious! This is a very easy to follow Greek spanakopita recipe for you to recreate this traditional vegetarian delight from scratch. Spanakopita is a very popular Greek dish, that comes into a variety of shapes and sizes. It can be made either in large pan and cut into individual portions (pan-sized spanakopita) or rolled into individual triangular servings (spanakopitakia). The main ingredient you will need to make this spanakopita recipe is of course spinach. Most spanakopita recipes also use feta cheese which is a favourite ingredient in all types of Greek recipes, be it fried, baked or used for stuffing until nicely softened and slightly melty. A mature feta cheese gives this traditional spanakopita recipe a bold and salty flavour, so be careful to just a little salt in the seasoning! Traditional Greek Spanakopita recipe – Make your own Homemade phyllo! Traditional Greek homemade spanakopita recipes use homemade phyllo dough or commercial ‘village’ dough (xoriatiko phyllo), which is a little bit thicker than the usually paper thin phyllo and gives a more rustic touch. As ‘village dough’ is a little bit difficult to find, you can make this traditional spanakopita recipe using either commercial phyllo dough, or, if you are feeling adventurous enough, make your own homemade phyllo! Roll each sheet of dough with passion for good food and it will truly reward you with a crispy, flaky and delicious crust on your traditional Greek spinach pie! So go ahead, give this super easy and delicious traditional Greek spanakopita recipe a try and amaze your friends and family with its crispy and tangy flavour. Enjoy! When done, heat the oven to 200C/fan 180C/gas 6. To prepare the filling for this spanakopita recipe, sauté the onions in a large knob of butter until soft and turning golden. Add the garlic and cook for a couple of minutes. Add the spinach in batches and cook until wilted. Cool, then tip into a bowl (leaving behind any excess liquid from the spinach) and mix in the nutmeg, feta, eggs, spring onion and season. For this spanakopita recipe you will need a non stick baking pan, about 25cm. Put the first sheet of filo in the pan and sprinkle with olive oil, letting the excess hang over the sides. Keep going with the rest of the sheets, turning a little before adding each additional pastry sheet and sprinkling with olive oil. Use 2-3 phyllo sheets, depending on how thick your phyllo is. Tip in the filling of the spanakopita and fold over the excess pastry to cover. If you like to prepare a larger pan of spanakopita for a big crowd, double the ingredients for the filling and use a 25*35 cm baking dish. Layer the 2-3 phyllo sheets to form the bottom of the spanakopita, tip in the filling and top with 2-3 more phyllo sheets. Brush the top of the spanakopita with olive oil and scar with a sharp knife. Bake in preheated oven for about 60 minutes until the phyllo is crisp and golden. Leave the spanakopita cool down for 10-15 minutes before cutting into pieces. Serve the spanakopita with Greek feta salad. Enjoy! Omg this site is fabulous! how much flour by cup?? cannot weigh it. e.g. A cup of all-purpose flour weighs 4 1/4 ounces or 120 grams. This chart is a quick reference for volume, ounces, and grams equivalencies for common ingredients. Flours.